Champagne cards with chocolate brown bows! Adorable. Eggplant cards, each with a slight variation. Sadly, this picture turned out very poorly. The contrast was too high and I didn’t have any natural light that afternoon. 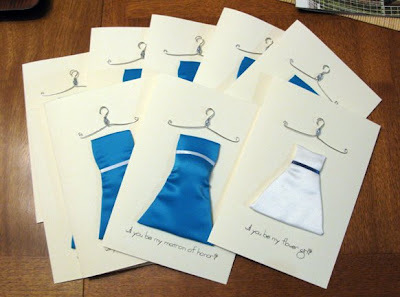 Another order for Dark Blue bridesmaids cards! My third in a row. Very unusual to have this many of the same color. At any rate, the color is lovely and I hope the bride likes them. I had two orders with the same color dress this week. That never, ever happens! Anyway, the dark blue/indigo is quite a rich and lovely color! I forgot to fix the direction of the hangers before I took this photo. Oops! But they are still cuties, especially the flower girl card with its little ribbon. Two bridesmaid cards in white! Sorry for the blur. Yellow bridesmaid cards! With white flower girl with yellow trim. Very cute! I love the blue! These were made for a bride that plans to have a beach wedding. She got a whole bunch of cards, one pregnant and one a flower girl. I just thought the blue was so vibrant, like a tropical vacation. Two of the first cards I ever made!